Welcome to the December issue! As 2016 draws to a close, I want to remind you to take advantage of the year-end holidays to spend time with your family elders and, most importantly, to capture their stories, be it using video, audio, or print, both to enjoy now and to enrich your family for years to come. I wish you and yours a healthy, happy, and prosperous 2017. I don’t know if any of the Kardashian-Jenner fans who visited the site will eventually hire Family Legacy Video® to create legacy video or audio productions for their families. But at least they’ve learned about a great way to capture their family storytellers and their stories to celebrate and share today and pass along as a keepsake for generations yet to come. Thanks, Kardashians! 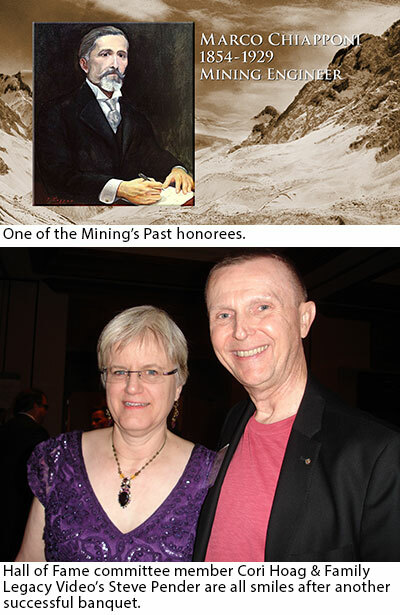 On Saturday, December 3, over six hundred members of the mining community gathered at the Marriott Starr Pass Resort & Spa in Tucson, Arizona to celebrate the achievements of industry leaders, both past and present. The occasion was the 34th American Mining Hall of Fame Banquet & Fundraiser, a production of the Mining Foundation of the Southwest. The MFSW introduced video to the banquet six years ago, and for the past five years, Steve Pender and Family Legacy Video, Inc. have worked with members of the Hall of Fame Committee to produce many of the video clips shown at the prestigious event. Steve’s video biography skills certainly come into play during the production of the video honoring Hall of Fame Inductees from Mining’s Past, which incorporates archival footage and photos, graphics, animation, music, sound effects, and narration to bring to life the stories of the people who contributed to the advancement of the mining industry in years, decades, and even centuries gone by. In the November Legacy Video Lounge podcast, Steve Pender answers a listener’s question about how to “keep the energy going” during a legacy video interview. You’ll find that episode and all of the other Legacy Video Lounge podcasts on the podcast page.